Australia - we’re a nation of travellers. In fact, 10.5 million of us made short trips overseas between November 2016 and 2017 according to figures from the Australian Bureau of Statistics. But whether it’s a short jaunt across the Tasman to visit our Kiwi neighbours or a more extensive trip through Europe, we often rely on travel insurance as a cost-effective way to safeguard our belongings, our travel plans and our health while we’re overseas. For many travellers, taking out an insurance policy is really all about the medical assistance and hospital cover it can provide in the event that something unexpectedly goes wrong. This is especially true for Aussies with pre-existing health conditions who rely on travel insurance as a safety net which allows them to travel abroad without the fear of being hit by prohibitively expensive overseas medical costs. But while many common pre-existing conditions such as asthma and diabetes tend to be covered automatically as part of most travel insurance policies, shockingly a health condition that affects 1 in 5 Australians every year often isn’t covered - mental illness. In fact, a recent Mozo mystery shop of 47 different travel insurers found huge inconsistencies when it came to cover for mental health conditions - from the way conditions are defined and diagnosed, to the number of insurers willing to offer cover at all. Ultimately that means Australians with mental health conditions are likely to find it far more difficult to know exactly what they can get covered for when they head overseas on holiday. Why do I need medical cover while I’m overseas? While Australians enjoy the benefits of a public healthcare system at home, those perks don’t extend to holidays abroad. In fact, some overseas healthcare systems can be seriously expensive (the United States being the prime example), and even where they’re not, costs can quickly add up if you end up needing any kind of medical assistance in a remote location. That’s why taking out a travel insurance policy with medical cover is a popular option for many travellers before going abroad. It could well prove a small price to pay when you consider that medical-related travel insurance claims often run into the tens of thousands of dollars and even into the hundreds of thousands in some cases - talk about a trip to forget! Not convinced? Take this example. 34 years old Jim and 36 year old Sara are planning a three week long trip through the United Kingdom and Europe in November. According to the Mozo travel insurance comparison tool, they would be able to take out a top level of travel insurance cover including unlimited overseas medical assistance and hospital expenses from as little as $170. That works out at a fraction of the price of a flight alone. Breaking your arm after slipping on a wet, cobbled street in London is hardly going to be a memory you cherish in years to come, but when it comes to travel insurance it’s an accident you cannot have foreseen and therefore one that your provider is likely to cover. Many insurers are often willing to provide cover for other pre-existing conditions as well, but there may be caveats to these depending on the severity of the particular condition. That’s why it’s always worth checking in with them to make sure that they’ll cover your own specific situation. 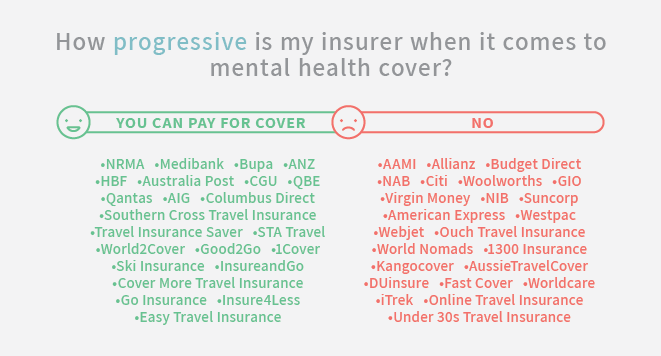 So while it might be straightforward to purchase a travel insurance policy that will cover your asthma or high blood pressure, despite being incredibly common in Australia, mental illness is a different story. According to Mozo’s recent travel insurance mystery shop, not one of the 47 travel insurers contacted offered cover for pre-existing mental health conditions as part of their ‘basic’ policies. Zip. Zero. Nada. “The travel insurance industry is exhibiting a high level of discrimination against mentalillness, with many insurers placing it in the ‘too hard’ basket,” said Mozo Director, Kirsty Lamont. But hold on a second! Because that doesn’t mean you’ll find it impossible to get cover for a mental health condition at all. It just means that you’ll have to do a bit more legwork to find an insurer that will cover you, not to mention pay more out of your pocket to do so. Which travel insurers cover pre-existing mental health conditions? So, let’s get the not-so-good news out of the way first. According to Mozo’s mystery shop, 51% of the insurers contacted wouldn’t provide cover at all for pre-existing mental health conditions. However, 49% of providers said they might - emphasis on might - provide cover for a mental health condition, but only as an added or additional extra (i.e. you’ll need to pay more). 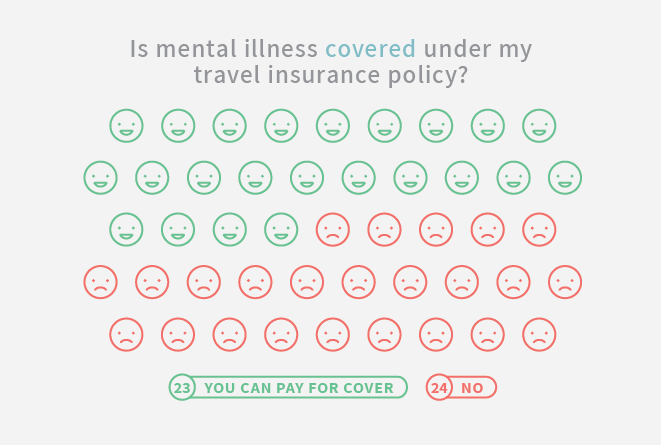 Aside from the list above, one simple way to find out if a travel insurer will potentially cover your mental health condition is to make use of Mozo’s handy travel insurance comparison tool. Simply plug in your destination, travel dates and age and you’ll be presented with a range of quotes. From there, click on ‘More info’ and under ‘Pre Existing conditions’ you’ll be able to see whether the insurer covers for mental health. What will affect my chances of being covered? And to top it off, there’s little conformity between insurers for any of these factors, which means the information you get from one won’t necessarily be applicable to another. “For customers who have suffered from past or present-day mental health issues, it’s an absolute minefield to wade through PDS forms to determine the level of cover a travel insurer is willing to provide you,” said Lamont. Different travel insurers have varying definitions of mental health or mental illness, though the definitions used in the Mental Health Act 1990 (NSW) and the Diagnostic and Statistical Manual of Mental Disorders are commonly referenced. Some of the more commonly listed mental health conditions are shown in the list above, but it’s always worth contacting your insurer directly to confirm whether or not they will cover a particular condition. Insurers also use vastly different time periods when it comes to classifying what is and isn’t a ‘pre-existing’ condition. Some insurers consider mental health related episodes that happened any time in the past as evidence of a pre-existing condition. That’s irrespective of the amount of time that has past and the severity of the condition. For example, you could have had a minor bout of anxiety 25 years ago, which was never officially diagnosed and has never recurred, yet that would be considered a pre-existing condition by some insurers. Other insurers only consider a condition as being pre-existing if it occurred more recently, with timeframes varying between providers from 60 days to five years. Finally, some insurers only consider a mental health condition to be ‘pre-existing’ if you’re being treated or currently experiencing it. There are also major discrepancies in the way different travel insurance providers describe pre-existing conditions based on the severity of the condition and whether or not it was officially diagnosed. 52% of insurers in the Mozo mystery shop only considered a mental health condition as being ‘pre-existing’ if it has been officially diagnosed by a medical professional. However, 48% of insurers considered a mental health condition as being ‘pre-existing’ simply if there were ‘signs and symptoms’ of the condition. For example, if you’d paid a visit to a psychologist or therapist in the past. Will my travel insurer require me to have a mental health assessment? By now you’ve probably realised that there’s very little consistency between providers when it comes to mental health and the provision of travel insurance cover for it. So the only way you’re really going to be able to find out if you can be covered is by going through a mental health assessment with a certified medical practitioner, and then passing on the results to your selected insurer. If the provider then decides to offer you cover, you can expect to be charged an additional premium on top of the basic cost of the policy. Some insurers will charge this extra premium based on a flat rate, while others will charge a unique fee based on your own specific situation. What can I do if I’m not offered cover? So you’ve gone through a mental health assessment and your selected insurer is still unwilling to cover your mental health condition. Okay, that’s not the outcome you wanted. You could try your luck by going through the process again with a different travel insurer, choose not to go, or you could make the decision to travel anyway. Even if you can’t get cover for your mental illness it doesn’t mean that you won’t be able to take advantage of the other benefits of travel insurance. After all, there are any number of unseen events that could happen while you’re away which travel insurance could provide cover for. Medical, dental and hospital costs: While you might not be able to get cover for your mental illness, that doesn’t mean you won’t be covered for a range of other unexpected injuries and even other pre-existing conditions (providing they come as standard or you get approved for them) if something does goes wrong. Luggage and personal effects: What happens if your phone, passport or luggage is stolen while you’re away? Well travel insurance could provide cover in the event of theft, usually in the range of $2,000-$12,000 depending on the policy you choose. Cancellation or delays: There’s nothing more frustrating than a delayed or cancelled flight, but your travel insurer could reimburse you depending on the policy you take out and the length of any delay. Rental car excess: If you’re heading off on an overseas road trip you may be pleasantly surprised to learn that many travel insurance policies cover excess on your rental car. Death and injury: We certainly hope it never comes to this but in case the very worst does happen, you or your estate could receive a payment from your travel insurer. If I can get cover, what happens if I need medical treatment overseas for my condition? By now you’ve navigated the minefield of different definitions, undergone an assessment and had your cover approved, but what happens if you’re overseas on holiday and you need medical or hospital treatment for your condition? If you’re not in critical need of assistance many providers recommend you get in contact with their emergency assistance teams straight away. Insurers generally have emergency 24/7 phone numbers for you to contact them on in these situations, and once you do they’ll be able to direct you to the appropriate medical facility or arrange emergency transport. Make sure that you have a copy of this telephone number in your wallet, bag and even better, entered as a contact on your phone. If you’ve already made it to hospital or received medical treatment then insurers still require you to contact them as soon as reasonably possible. And it’s really important that you do, because your cover or ability to make a claim could be affected if you don’t let them know what’s going on in reasonable time. Will a stay in hospital be covered? Yes, if you’ve had mental health cover approved as part of your policy then your insurer will in all likelihood cover your hospital costs overseas. However, your insurer will probably have specific limits for your hospital stay which are based on a dollar figure for each night or for your overall stay in hospital. That means you may have to pay out of your own pocket for a hospital stay that exceeds these maximum limits, so it’s a good idea to find out what these limits are from before you settle on a policy. Already looking at flights and accommodation for your overseas adventure? Set yourself up for a successful (and less stressful) trip with these tips. At times travelling can be a stressful venture, but you can limit that stress by being prepared. So whether it’s research on the cities you’re going to or the accommodation and flights you’re taking to get there, doing your research beforehand may help lessen that stress. Before you head away make sure you make an appointment with your doctor to talk about any medication you may need while you’re travelling, as well as sufficient quantity to last your trip. It’s also worth noting that some medication may be unavailable to buy or even illegal in certain countries, so make sure you find that out in your pre-trip research. You’re not going to want to haul along binders of documents with you, but it’s always a good idea to prepare any of your travel documents, letters from your doctor and any emergency contacts for your travel insurer, family or friends before you leave. Getting carried away with overeating or drinking is an easy trap to fall into when you’re out of your normal routine, especially when travelling with friends or a big group. But if you know that your diet or sleeping patterns will have a big impact on the way you feel, it could be a good idea to have some ready-to-go techniques up your sleeve like meditation or simple exercise to keep you grounded and feeling fresh. Australia has an agreement with 11 different countries which allows Australian visitors access to ‘publicly funded medically necessary care’. Some of the countries include Belgium, New Zealand, Sweden and the United Kingdom, but it’s worth noting that the level of care you’ll have access to differs between them. While you might not want to limit yourself to travelling in these specific countries, if you haven’t been able to secure cover for your mental illness, at least knowing that you have a safety net of some kind could provide you with extra peace of mind. Sure travelling can involve a lot of preparation, it can be stressful (I mean, who likes running for a connecting flight after a delay?) and you’re likely to come across things that you weren’t expecting and can’t plan for. But it’s an amazing experience and a heap of fun, so safe travels wherever you go! For more tips, helpful contact numbers, and information about what the Australian Government will and won't be able to if you experience mental health problems while overseas, visit the Smartraveller guide for Australian travellers with mental health conditions.